As manufacturing and supply chain processes become more complex and competitive, procurement, management and coordination of international projects prove to be increasingly challenging. Our expediting service adds value to your projects through the inspection of manufacturers and assessment of manufacturing production plans and capacity. Our comprehensive expediting services help you to avoid delays and ensure compliance with contractual conditions and specifications as well as applicable international codes and standards. Our experts bring global experience and can provide close cooperation with technical and scientific institutions to support your industrial project anytime, anywhere. Our experts actively keep an eye on the deadlines and manufacturing schedule to help you reach defined project milestones and ensure that equipment, materials and components arrive at the right place, at the right time. We also help you prevent long capital stock and safeguard company reliability and integrity. Our experts work with you to set timelines and meet payment and delivery deadlines. We promptly identify potential bottlenecks and threats to avoid costly delays and liability penalties. 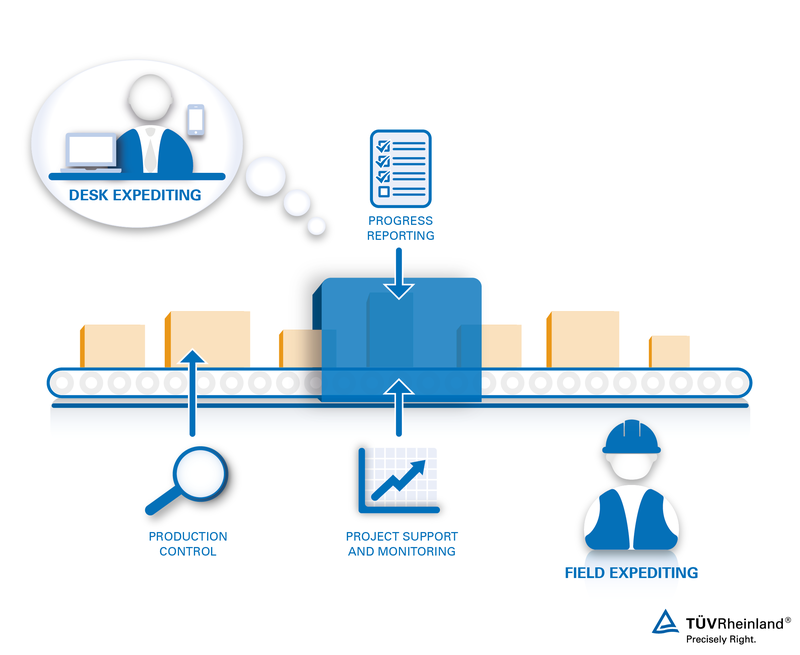 To achieve project goals, field and desk expediting should play a major role in professional project planning and management. Comprehensive support along the entire supply chain, including follow up on major project milestones and deadlines. Evaluation of supplier production potential and quality before an order is placed. Monitoring production progress, manufacturing schedule, supplier workload, and identifying areas of concern. Verification of contractual conditions and actual project status. On-site third-party inspection, project support and expeditor review of actual order status. Offsite monitoring of order progress at specific milestone points. 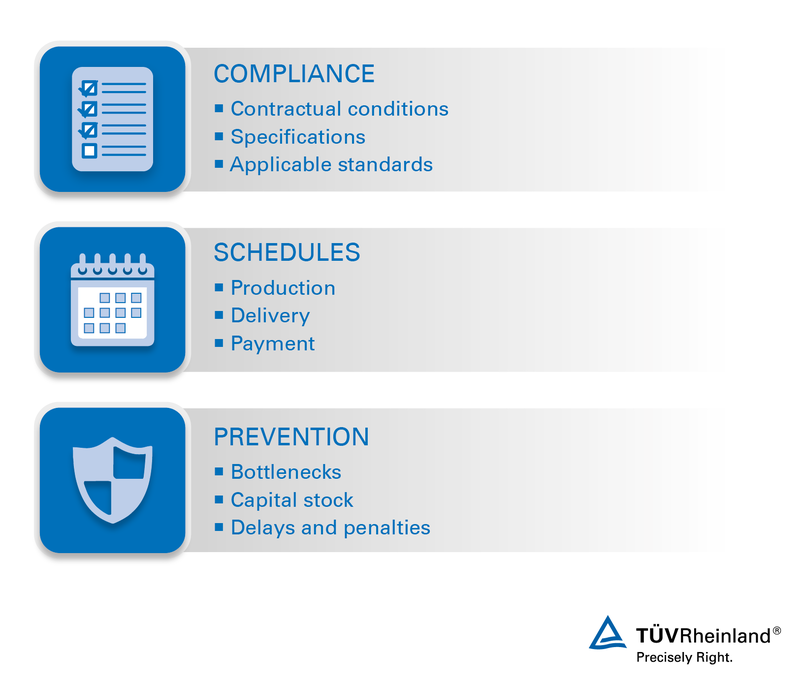 For over half a century, TÜV Rheinland has been ensuring quality and timely delivery of industrial equipment, machinery and components. Today we serve global projects in over 65 countries. With global experience and permanent cooperation with technical and scientific institutions, our expediting experts are extremely proficient and technically knowledgeable in a wide range of industries. Contact us to talk about expediting services and request a quote for your industrial project.